My kids are 9 and 7. In the past we've done seasonal rentals for just over $100/kid. The equipment is crap. Next year I think we're going to buy them each a pair of Roces adjustable boots and buy skis, either new or off ebay. For children's skis in the 110-120 cm range, is there a difference between brands? I might tune them myself, is there a recommended base/side bevel angle for children? We have just recently been through that age with our daughters, and our nephew is now 7 years old as well, so a bit of experience under the belt.? Unfortunately, most skis for kids are foam core and are not made to last.? The upside of that is that they are light and easy to handle.? Having said that, and being the Chief Ski Tuner in the family, I can say that there does seem to be a difference in quality between brands.? We've had skis from Head, Fischer, Elan and K2.? Surprisingly, the K2 skis seemed to be best -- the bases stayed dead-flat, resisted scratching and gouging, held the wax well, and the top sheets held up well too.? Fischer and Elan were also very good.? The Head skis all had problems with base flatness -- all became edge-high very quickly after only a couple of hot-waxes (bases warped from the heat? ), and the PTEX would gouge easily.? -- Don't buy too long!!! Thinking you're doing your pocketbook a favour by having them last a season or two more is false economy.? Unless they are already good skiers, skis that are too long will only hold them back, as they will struggle to control them, they won't have fun and may get turned off the sport (this happened to my 7 y-o nephew this year -- his skis were too long, he was always in the back seat by fear instinct, and we never saw a smile on his face -- his skiing ability actually regressed from last year).? Stay short, and they will have way more fun. -- Pay a bit extra and get a Railflex binding, so you can adjust for yearly changes in boot size without redrilling; gives them extra stand height, too, which is good. -- Put on a 1 degree base bevel and 0 degree side bevel, unless you have lots of ice, then maybe a 1 degree side.? Keep them sharp, as they will need grip on hard snow and steeper stuff, just like Dad.? When my younger daughter was 10, she skied with a friend and her family at Mt. Tremblant for a few days, and it was icy -- the whole family was falling all over the place, but our daughter had nary a single skid or fall.? She thanked me afterward for keeping her skis sharp.? -- Detune the tips and tails to make turn initiation and release easier.? -- Keep them well waxed -- there's nothing more annoying to a kid who can't keep up to their pals because there is no wax on their skis...."Hey! Wait for me!" is not something you want your child to be shouting on the ski hill.? This happened many times with our kid's friends, and they were just frustrated, watching our kids glide across the flats, while they were poling and skating like crazy to keep up. -- Make sure you get good boots! They don't have to be fancy, racy or even new.? But the flex and cuff height has to be suited to their height, weight, strength and skiing ability.? This is just as important as for us grown ups.? Using my nephew again as an example -- he is a really tall kid for his age, but this year his boots were waaay too short in the cuff, and did not push him forward where he needed to be, and gave him no ankle support.? As a result, and combined with the too-long skis, he skied bolt upright, no knee bend, and his skis were always out of control.? Not good.? Despite expensive lessons, he had a terrible season, and skied worse than last year. -- If you buy at a ski swap, take a small straight-edge or carpenters square with you, so you can check for base flatness in the shop.? You don't want to have to pay for a base grind right after buying a great bargain, and edge-high or base-high skis can be difficult to handle for a junior. Hope this helps, but let me know if you have any more questions. 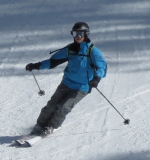 PS -- skiing with my kids is one of my greatest pleasures in life.? I love it! It is so much fun, and always has been since day-one.? If they are having fun, and whooping and squealing all day, then I'm a very happy guy.? Knowing they are on the right gear, that lets them do what they want and have fun wherever on the hill they want to go, and not have to worry or fight the gear, is one less stress for me and for them, and makes all the up-front effort worthwhile.? Bottom line: you want good gear that will help them learn and to have the most fun possible, but not to prevent learning and be a frustration and annoyance. It is important to take the time to get it right. Enjoy!!! Thanks for all the tips. We ski in the northeast too, so I will be taking your advice with a 1/1 deg tune. Is there a particularly good online source of used kids equipment you can recommend, apart from the usual suspects i.e. ebay, Craigslist. For kid's skis, which option is preferable: 1) spend more on a better ski (e.g. w/ rail binding, wood core), but keep the ski for more than 1 season even if it is a bit short; or 2) spend less on a cheaper ski and replace it each year with a ski of the correct length? Probably one of the best places to get used kids ski gear is at the annual ski swaps that happen every fall.? All kinds of shops and groups put these on.? In our area (Toronto), these can be organized by local ski clubs, schools, ski shops, the ski patroller's association...you name it.? The advantage of these is that you can actually see and feel what you are getting (and slap that straight-edge on the bases! ), rather than just look at pictures on the web.? Kids gear can get pretty beat up, and is often not maintained at all.? It's good to be able to see before you buy. I don't think I have ever seen a wood-core kids ski, except race skis.? As for length, our girls had each of their skis for about 2 seasons.? We bought them at the correct length (not too long? ) right from the start, and let them ski them short the 2nd year.? What the older one skis for 2 years can then be handed down to the younger one, so you can get more than two years out of a pair.? For this same reason, definitely go for a railflex-type binding, at least for the older child, as they will need a binding adjustment at least once, and if handed down to child 2, there's at least one or two more adjustments -- pay $30 or $40 more up front, but save redrilling costs later. At some point, depending on how strong a skier your kids become, and how fast they grow, they will transition to light adult gear.? This happened with our girls at age 13 for the older (cautious, tentative) daughter, and at age 11 for the younger (aggressive, strong) daughter.? They were both at the height and weight and skiing ability to be able to handle it at the time.? But the epiphany they had was well worth it.? "Dad! These are soooo stable and smooth! Wow! I'm on grown-up skis!" Huge confidence boosters.? We bought them twin tips for the Fun-Factor and their wider waist.? They are having a blast on these.? There are some pretty cool twin tips for young kids too, so something for you to consider.? Kids love goofing around on these, even if they never go in the park.....skiing backwards and doing 360's is just a hoot to them....way fun! And the graphics are just SICK, dude!? Great stuff Svend....you are the "Dean of Kids Skis".....great thought on the edge tuning as well. levelninesports.com has a pretty good deal on the Head XRC skis for $99 (at least last time I checked). My kids have been skiing the Head junior skis for years and I've been very happy with them (the kids too ). I think a "kids ski gear" should be a section on the revised forum. I had never even considered the issues associated with outfitting kids each year. Jim, a kids section is an interesting idea. If there are enough members that have young kids, then it would be very helpful. I wish I had a resource like that when I was going through the yearly buy-sell thing with my kid's gear. Would have saved me from making some mistakes, esp. with boot fitting. The girls are now both into adult gear, so we're past that stage (and I make sure the boot fitters in the shops take their needs seriously -- most guys are great). I'm happy to pass on any experiences to others if a kid's section is in the works. High Angles -- we had two pairs of kids XRC skis, and both had the same problem with bases not remaining flat. They started out flat when new, and then quickly became edge-high. Not sure if it was the temperature of the waxing iron that warped them, but similar kids skis from K2 and Fischer were fine, and were handled the same. Maybe the newer versions are better-made and don't have that problem. I ended up going with a Rossi X1 with bindings for just over $100 from REI (using my REI dividend). I have 3 sons each 2 years apart so every season we do the "ski shift" dance and pass them down the line.